Historical Baseball Ticket Stub – Featured Item This Week! Check out our featured eBay listing this week! We are auctioning off a historical baseball ticket stub from a Brooklyn Dodgers game in August 1955. This game marks Sandy Koufax’s first career win! 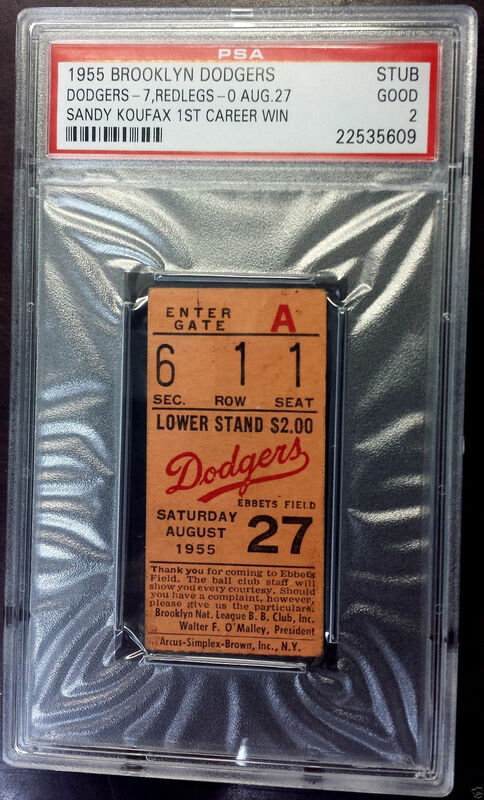 Less than 7,500 fans were in attendance that day, making this ticket a super rare collectible! 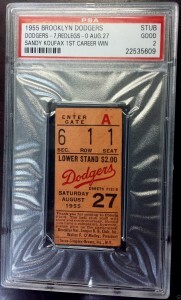 This ticket stub is very rare in any condition, the one we have up for sale is graded GOOD (2) and encapsulated by PSA. The auction ends on Sunday, May 4th, so if you or someone you know is a huge Brooklyn Dodgers or Sandy Koufax fan, check it out and spread the word! This entry was posted in General Info on April 28, 2014 by admin. 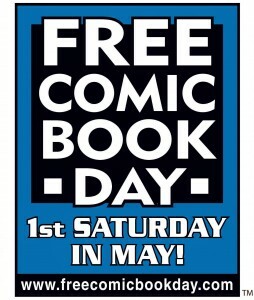 Free Comic Book Day at Royal Collectibles! Saturday, May 3rd, 2014 – Be there or be square! 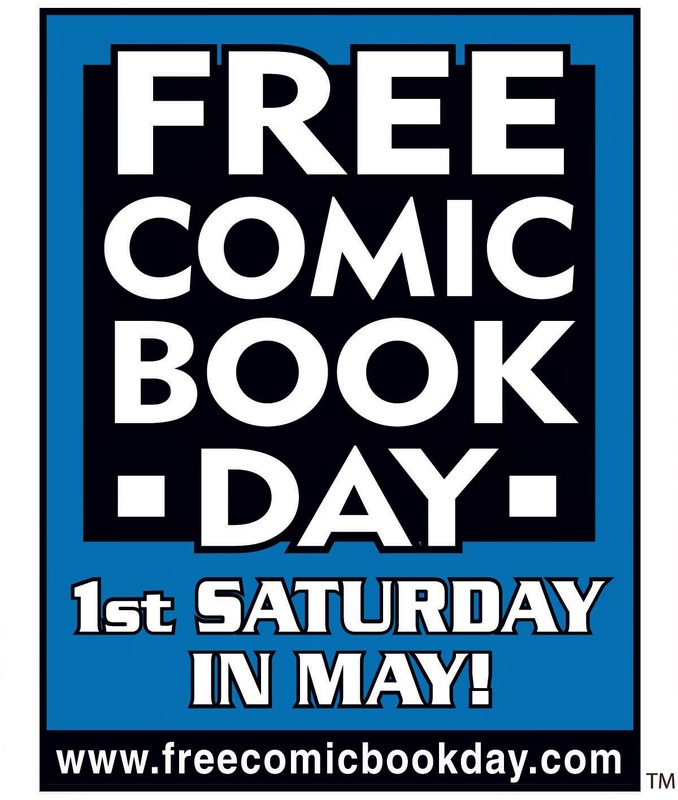 We’ll have an large assortment of FREE comics for everyone (limit 3 per customer). From 1-3pm, comic book & trading card artist BRIAN KONG will be appearing at our store to do sketches for the public! For $20, you can get a sketch of a comic character of your choosing and you will receive a 10-minute black-and-white sketch by Brian on a blank-cover comic book that we will provide. First come, first serve! All you have to do is arrive in your favorite superhero costume to enter! Photo with Spider-Man! Your friendly neighborhood Spider-Man will be swinging by Royal Collectibles in his hometown of Forest Hills for free photo opportunities! From 1-3pm and 4-6pm stop by for a photo with your favorite Web Head! This entry was posted in General Info and tagged comic books, fcbd, fcbd 2014, free comic book day on April 26, 2014 by admin. Looking to Spruce Up Your Bat-Cave? Batman, The Dark Knight, The Caped Crusader, all names that resonate with men, women, and children alike. 75 years ago, Bob Kane gave the world one of the most enduring, most inspiring, and all around one of the greatest comic book characters in the history of comic books. Warner Bros. and DC Comics has many great things in store for Bat fans throughout the year; but Royal Collectibles is your one stop hub for all great and unique Batman memorabilia. Check out our 1/6 Scale Batmobile by Hot Toys! Can fit a 12″ Batman figure inside! 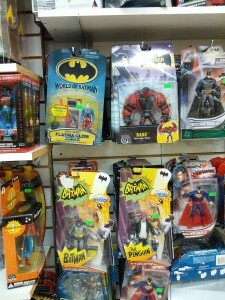 Located in our very own Batcave, you will find some of the best Batman action figures that have ever graced store shelves. 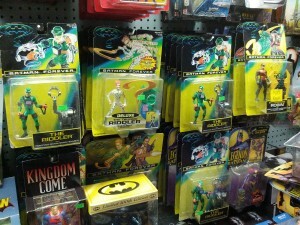 Kenner’s “Batman Returns”, “Batman Forever”, “Batman: The Animated Series”, and other Batman products reflecting the comics, cartoons, and films. Most of the figures and toys produced for “Batman: The Animated Series” have become very collectible over the past years as Paul Dini and Bruce Timm’s work have become more recognized and prolific for giving fans and non fans what many people feel is the definitive take on The Dark Knight. Action figures and toys based on these beloved designs are getting harder to come by. My recommendation: get them quicker than Batman gets to the top of the GCPD at the first sight of the Bat signal. They are all reasonably priced and will be excellent additions to your collection, or just great pieces to have to commemorate an icon. 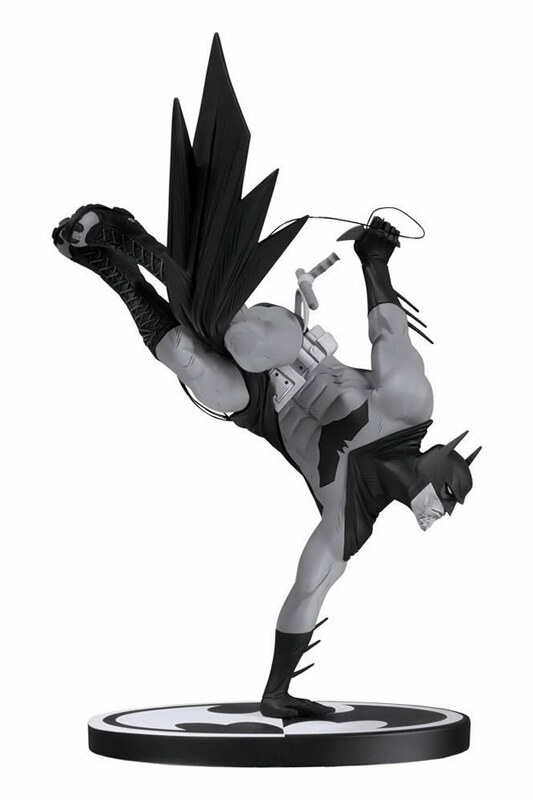 If you’re on the market for more current Bat related items, DC Collectibles has been producing a fine assortment of Black & White Batman statues. What makes each statue truly special is that they are designed by artists who have left their personal stamp on the Batman. Be it Jim Lee, Greg Capullo, or even a Batman sculpt based on the design of the hit “Arkham City/ Arkham Origins” costume, you’ll find it. As an owner of one myself, I must say that they are really beautiful. For someone just getting into collectibles, or for someone that just wants a nice keepsake piece reflecting their favorite Batman, this line of statues is a perfect starting point. You are bound to find a design that resonates with your tastes and you will not be disappointed with the quality in which these have been made! 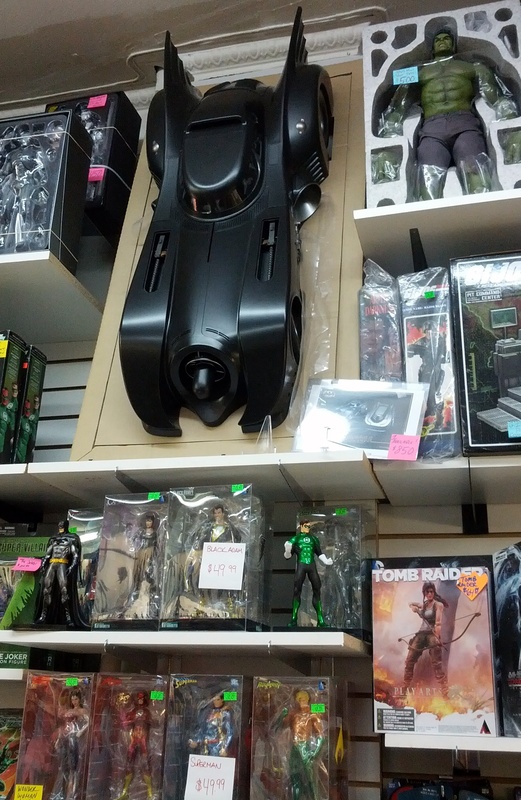 There are so many more Batman products that I could think of, but how about you stop by the store and see for yourself what we have. I promise you won’t leave empty handed. After all, maybe you’re on the market for Superman instead. This entry was posted in General Info on April 24, 2014 by admin. Every issue features original cutaway artwork that reveals hidden secrets, detailed profiles of characters, a history of the teams, and a timeline of Marvel’s greatest battles, plus inside information about the history of Marvel Comics. Fans of the old Official Handbook of the Marvel Universe will enjoy this updated and expanded new series from Eaglemoss Publications! Collect them all, organize them in the Official Binder, and you’ve got a comprehensive history of the Marvel Universe at your fingertips! We just got in issues #11 through #22 this week! Come check ’em out! This entry was posted in General Info on April 16, 2014 by admin. 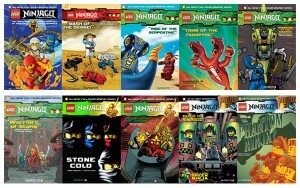 Lego Ninjago Graphic Novels – back in stock! Fans of the Lego Ninjago series will be pleased to know we are now full stocked in the graphic novels, volumes 1 through 9! Released by Papercutz, these 64-page full cover books are a fun and affordable at $6.99! Don’t forget to enter a photo of one of your child’s Lego creations for a chance to win the new Lego Legends of Chima graphic novel and a $25.00 gift certificate to our store! More details in the “Upcoming Events” section of our website. 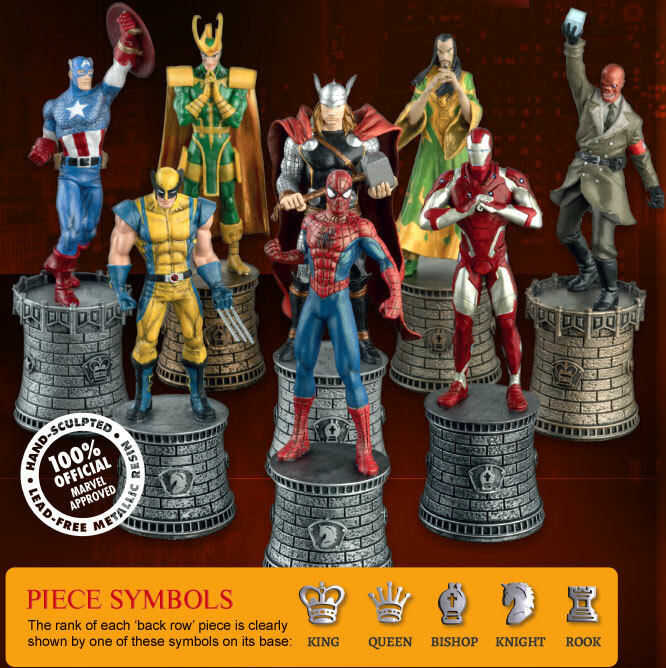 New Marvel Chess Figurine Collection! Following the wildly successfully Batman and Justice League Chess figurine series, Eaglemoss Publications will now be releasing figurines in a new line: the Marvel Chess Figurine Collection! All of your favorite Marvel characters will now be available as individual chess pieces, collect them all and you’ve got the ultimate Marvel Chess Set! Each figurine comes with a full size magazine loaded with information about the character including origin information, notable appearances, key points in the character’s history, and so on. If you’re interested in collecting all 32 pieces, consider joining our pre-order list and save $2.00 OFF each figurine! This entry was posted in General Info on April 2, 2014 by admin.